During the latest years the web has become the dominant way to shop everything from the electronics to travels. But you can just as easily use the web to find all you need for example a wedding blog can help you to organize the wedding of your dreams, where you want, when you want and with who you want. Advantages of a wedding blog? Using a wedding blog allow you to don’t think about the location, the organization, the invitations and all the other things linked to a wedding day. This day would be memorable and the ceremony would be the most beautiful of your life and everyone wants to make it a very special day to be remembered long life the commitment made to each other. So, you have found your soul mate. You are head-over-heels in love, and the time has come. You are getting married in Italy! It’s a time of excitement, joy, and new beginnings. It can also be a time of pain, sorrow and misery if not planned correctly with a help of a wedding blog. Few people realize that having a beautiful wedding in Italy does not require spending their entire savings. In particular if you’re planning a wedding in Italy, learning where and how to cut costs in way to not exceed your budget. Immersed in the green Tuscan countryside, the 16th-century villa is located in the Garfagnana region, 40 kilometres from Lucca. The tuscany villas still features elements of its glorious past, such as the German garden, and has a fantastic hanging terrace giving a breathtaking view in the Apuan Alps. Next to the outdoor pool (10×5 m) with wooden pool side and furnished with sun loungers and gazebos, is an ancient well which has now been transformed in to a comfortable whirlpool swimming pool covered having a glass dome. An ancient sentry post, the lemon house has been converted into an exercise and relax area. The villa is fitted with period furniture and the ceiling of the lounge is decorated along with ancient frescoes. The villa accommodates 10+1 individuals in 4 double sleeping rooms, 2 single bedrooms, 4 bathrooms and 1 half bathroom. Ground floor: dining room with Television set and fireplace, fully equipped kitchen, storeroom, small tea room, reading room with cartoon video cassettes for children and trekking maps, stone stair. First floor: music lounge with audio system, library and “secret garden”, 3 double-bedded rooms, 1 twin-bedded room, 1 single bedroom, 1 room with a super-single bed and a supplementary single bed on request, 4 bathrooms (one with whirlpool shower, one with shower as well as two with bathtub). Outdoor, in the lemon house: a small gym along with a room for dining ing fresco. The villa is supplied with swimming pool, cot bed, car park, DVD player, bicycles, satellite TV, electric oven, CD player, gas oven, working fireplace, washing machine and dishwasher. The post office, a chemist`s, a doctor`s surgery along with a supermarket are 800 metres from your villa. A hypermarket (open up on Sundays) and shops of any kind are in Castelnuovo or Gallicano (4 km). A restaurant is 2 kilometres from the villa. Lucca 40 km – Florence 100 km instruction Pisa airport 60 kilometers – Massa Carrara 40 km – Viareggio 40 km. The villa is very easily reached. An excellent littoral extending with regard to a lot more than a hundred and fifty kms along with unspoilt organic recreational areas as well as essential archaeological websites within the hinterland: encouraged in order to Tuscan Maremma, among the forty-four locations on the planet you need to go to at least one time that you experienced, based on a listing beginning upward through the well-known Ny Occasions at the start associated with ’09. Therefore, why don’t you in order to lease an average tuscany villas rental property within Grosseto, Follonica, Castiglion della Pescaia or even Orbetello, the most crucial cities associated with Maremma? Your own vacation home within the southern area of Tuscany might be a great starting place with regard to activities across the paths within Maremma Organic Recreation area, amongst century-old olive trees and shrubs, in the breakthrough associated with colonies associated with drinking water parrots as well as boars, the actual image of the area. If you want archaeology, you can travel to the actual Etruscan necropolis associated with Vetulonia or even the actual archaeological website associated with Roselle, in which the continues to be from the historic occupants associated with Tuscany mix along with individuals from the Roman “conquerors”. People who adore sports activities can’t avoid the opportunity to attempt a few windsurf, in order to cruise in the direction of Giglio as well as Giannutri island destinations and also to go to the region through hill bicycle or even about the back again of the Maremmana equine. At night, in your own rental property within Maremma you are able to flavor a few standard meals, for example “scottiglia” (the actual so-called Maremmana cacciucco made from combined braised beef) as well as roasting or even stewed boar, cleaning all of them lower along with “Morellino di Scansano”. In a nutshell, the tuscany villas within Tuscan Maremma with regard to holidays focused on character, lifestyle as well as sports activities. The number of occasions perhaps you have experienced issues within getting a celebration because of the large sum associated with family members as well as buddies you will possess enjoyed in order to ask? The actual numerous period individuals residing past the boundary possess rejected your own invite? If you wish to resolve each one of these issues, commemorate almost all the most crucial occasions in your lifetime within a villa with regard to lease within Tuscany. Certainly, numerous Tuscany villas function broad lounges as well as ballrooms (ideal for company conference too). Furthermore, possibly they have got their very own kitchen areas as well as excellent chefs or even they have got contracts along with providing businesses which, particularly within the great time of year, may change the actual home gardens encircling these types of homes within actual heaven edges. Furthermore, these types of Tuscan villas with regard to events function vacation flats with regard to taking your own family members as well as buddies originating from remote locations actually for any 7 days. A simple solution that provides all of them the chance associated with being released on the a few times ahead of time as well as going to Florencia museums or even Siena thin roads (each Florencia as well as Siena tend to be inside simple achieve through any kind of portion of Tuscany). Finally, if you are determining whether or not in order to set up your own celebration within a villa, think about this remedy provides fantastic configurations as well as total personal privacy for you as well as your visitors. Fall in love with the charm and beauty of Chianti, Tuscany. Explore its every nook and cranny with an insider guide to the best way to get around this majestic wine region. If you are in the process of booking your accommodations and going through the wonderful selections of Tuscany villas to rent, make sure you take time to learn the ins and outs of Chianti in order to fully enjoy your stay. For extended visits, Tuscany villas to rent offer a viable option, especially for families with children in tow. By staying in a rented villa well away from the hustle and bustle of tourist crowds, you can look forward to enjoying the unadulterated view of sloping hills and quaint hilltop villages that continue to lure travellers from all over the world. When visiting this Italian region you will discover that it is quite a large area, which means moving around from one place to another can be quite a challenge – especially if you plan on using public transportation. The best way to explore Chianti is undoubtedly by driving around – with the aid of a GPS or a detailed map, of course. However, when planning to tour Chianti without a car, here is some helpful information to help you a little. You will be happy to know that the railway line is quite developed in Tuscany. However, take note that this mode of transportation does not reach the main attractions of Chianti. But rather than being a hindrance, this is actually a good thing, as it provides you an unfettered view of lush vineyards and beautiful landscapes without busy train stations and rail lines getting in the way. There are two main train stations in Chianti – one in Castellina, which connects you to Florence and Siena, and another one in Poggibonsi. If you are planning to visit Florence, you will need to change trains at Empoli train station. It is generally best to travel around during weekdays, when you can catch a train every 30 minutes. Of course, if you are planning to make Chianti your central destination when booking Tuscany villas to rent, it’s always best to do a little research ahead when it comes to relying on public transportation. When in Chianti, you can go practically anywhere by riding a local bus. However, you should check for the bus schedules ahead of time so you don’t spend valuable holiday time stranded at the bus stops. SITA buses are scheduled regularly leaving from Santa Maria Novella train station in Florence and making stops at every village. 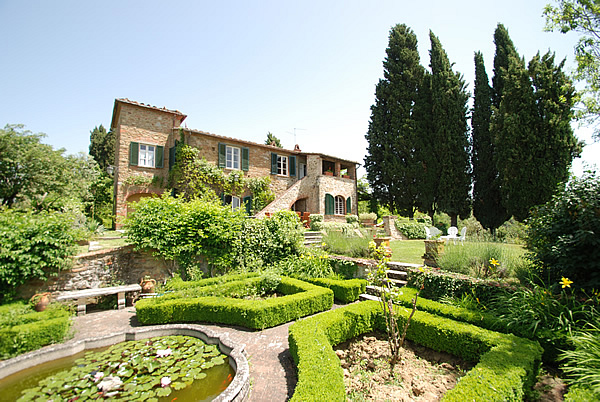 When in Tuscany, villas to rent can sometimes be a distance from shops or restaurants. One popular option is to rent a scooter or bike to get around. This is especially ideal if you are traveling on your own. There are plenty of scooter and bike rental companies all over the region and the rates are usually very reasonable for extended periods. Giovanni Balboni works for To Tuscany, who specialise in finding the perfect Tuscany villas in Chianti as well as selected villas in Umbria and Puglia. To Tuscany is proud of their villas and their reputation. All our Tuscany villas are personally selected and visited by our representatives to ensure we offer only the best in the region. If we are looking for a slow holiday in close contact with nature, which would lead us far from the pace imposed by the city life, the solution is renting a farmhouse in Tuscany or one of the many a tuscany villas. Surrounded by hills covered with vineyards, olive trees, cypresses, pines, meadows and cultivated fields seem to be in a dream (rightly l `UNESCO included a few glimpses of Tuscany one of the sites considered patrimony of humanity`). A holiday in tuscany villas as this will allow us to do a bit of exercise and regain better physical shape . How? With excursions by mountain bike along our paths and among the white houses of which Tuscany abounds. Trekking up and down the gentle slopes of the hills. Again, if we opt for a structure with riding, spending a few hours on horseback. Not wanting to play sports? So we always spend our days reading a book and sipping a hot cappuccino in the arbor of our Tuscany villas. Visiting one of the many small medieval villages of which Tuscany is rich. Maybe sitting at the bar of the main square, there is always a `n, chatting with the elders of the place or, more simply, to watch them play cards. But that’s not all. Why stay in one of the many farmhouses in Tuscany also means to spend a romantic holiday in one of the many tuscany villas . All around us, in fact, there will be rustic and warm, yellow ocher and red brick, wood-burning fireplaces and stoves, old wrought iron or ceramic tile, dark wood furniture and stone floors. L is ideal if you want to spend a holiday Tuscany with the people we care about most. Situated in Florence, HolidayHomesTuscany S.r.l. has been renting holiday houses in Tuscany for years:apartments in villas in the Tuscan countryside, farm holidays apartments, holiday apartments in historical centres, detached villas – luxury villas, tuscany villas villas with swimming pool, luxury villas in Medieval castles – and finely renovated old Tuscan farmhouses with private swimming pool. The owners directly manage all the holiday accommodations proposed here (villas apartments and farmholidays). After having booked one of our holiday houses, tuscany villas you will be put in contact with the owner. The owner will welcome you at your arrival and will be at your disposal during your holidays. Tuscany is one of the most visited regions in Italy. Six Tuscan sites are part of UNESCO World Heritage: the historical centres of Florence, Siena, Pisa, San Gimignano and Pienza and the Val d’Orcia. Cities of art such as Florence, Pisa, Siena, Lucca, Arezzo and centres like Volterra, San Gimignano, Montalcino, Pienza, Cortona, Sansepolcro, Monterchi and Poppi attract every millions of tourists from all over the world.Medieval castles dominate the wonderful hilly regions of Chianti, Val d’Orcia, Valdichiana, Mugello,Garfagnana and Casentino, scattered with old farmhouses tuscany villas that have been transformed into luxury villas. The Apuan Alps rising alongside the beaches of the Versilia and the reefs in Maremma characterize the western part of the region. Tuscany offers numerous folkloric events – the most famous being Siena’s Palio, the Calcio in costume in Florence (football as it was played in the Middle Ages), the Saracen Joust in Arezzo and the Gioco del Ponte in Pisa -, the possibility of tasting the genuine dishes of the typical Tuscan tuscany villas cuisine and wines renowned all over the world, haute couture boutiques, craftsman workshops and many other specialities and events that make your holidays in Tuscanyunforgettable. If your are willing to spend your holidays in Tuscany , among the villas with swimming pool, luxury villas, apartments and farmhouses that we have selected for you, tuscany villas you will certainly find the accommodation that fits your needs. Cities of art such as Florence, Pisa, Siena, Lucca, Arezzo and centres like Volterra, San Gimignano, Montalcino, Pienza, Cortona, Sansepolcro, Monterchi and Poppi attract every millions of tourists from all over the world.Medieval castles dominate the wonderful hilly regions of Chianti, Val d’Orcia, Valdichiana, Mugello,Garfagnana and Casentino, scattered with old farmhouses tuscany villas that have been transformed into luxury villas. The Apuan Alps rising alongside the beaches of the Versilia and the reefs in Maremma characterize the western part of the region. The owners directly manage all the holiday accommodations proposed here (villas apartments and farmholidays). After having booked one of our holiday houses, tuscany villas you will be put in contact with the owner.